Additional information on the prevalence of diagnosed asthma for children under 6 years of age in urban and rural areas can be found in the Environmental Risks/Conditions section of the Early Child Development Module. Additional information on asthma prevalence in children 1 to 4 can be found in the Environmental Risks/Conditions section of the Early Child Development Module. 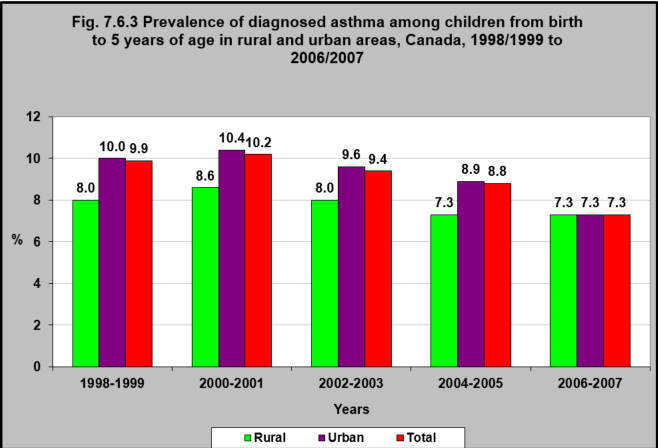 In 2006/07, 7.3% of all children under 6 had asthma (diagnosed by a physician). That was down from 8.8% in 2004/05. In 1998/99, the rate of asthma was greater among children living in urban settings than in rural settings. However, by 2006/07 that difference had disappeared. 2CICH graphic created using data adapted from the National Longitudinal Survey of Children and Youth, Cycle 7 (2006-2007). http://www.dpe-agje-ecd-elcc.ca/eng/ecd/well-being/longdesc/figure6-eng.shtml– accessed May 22, 2017. It is encouraging that there has been a decrease in the prevalence of diagnosed asthma among children 1 to 5 between 1998/99 and 2006/07 – with fewer children living with symptoms of the disease. 1Asthma Society of Canada website. What is Asthma? http://www.asthma.ca/adults/about/whatIsAsthma.php – accessed June 24, 2017.